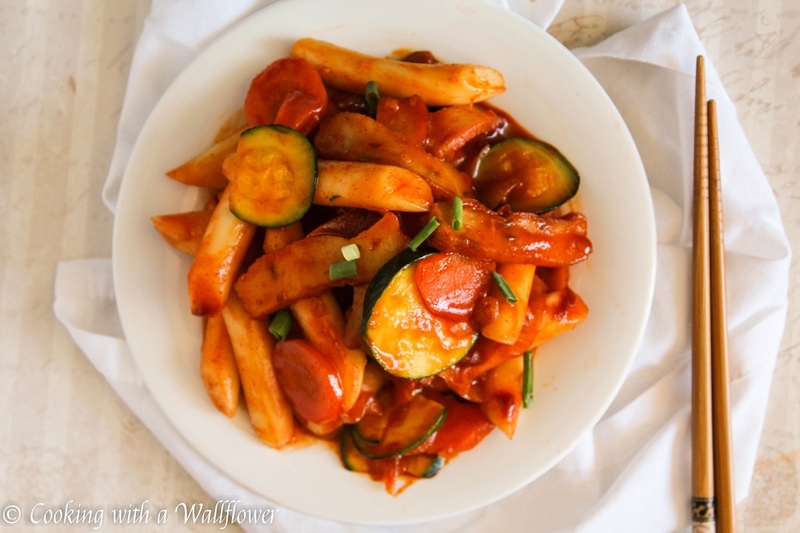 Rice cakes cooked with assorted vegetables and fish cake in a sweet and spicy sauce. These Korean rice cakes are delicious, easy to prepare, and taste like those found in Korean restaurants. It’s been awhile since I had Korean food so I figured it’s time to make my own. There’s something about Korean cuisine that’s so addictive. It must be all those spicy dishes. I really can’t resist them. As you can probably tell with some of the recipes I’ve posted previously. Like this one and this one. Whenever I’m having dinner with a friend at a Korean restaurant, I usually order bibimbap, tofu soup, spicy pork, or Korean rice cakes. It makes life so much easier when I have a list of my usuals. I’m really indecisive and having to decide on the spot what I want for dinner can be a long process. To save time, I like to go online, find the menu to the restaurant I’m going to eat at, narrow down my choices, go to the restaurant, and then decide what I want to eat based on the few I preselected. Um… Yeah. Does anyone else do this? Or is it just me? Have you ever had Korean rice cakes? They are sooo filling. I love how chewy rice cakes are. 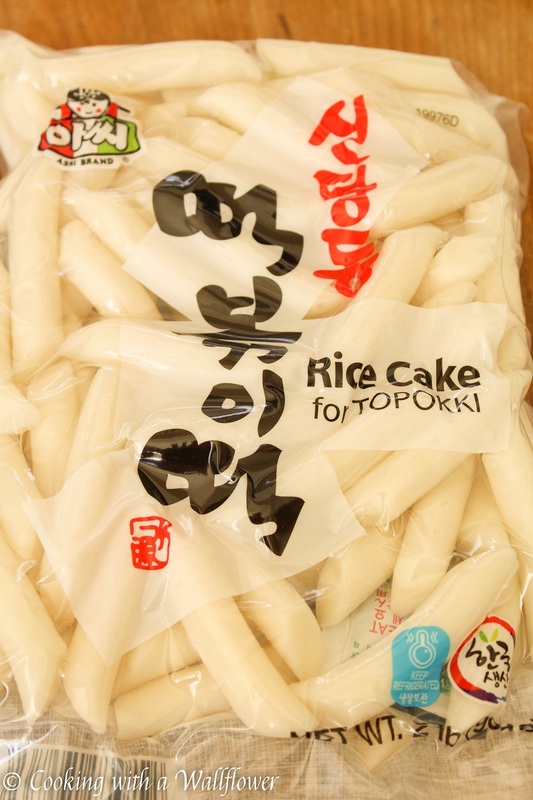 Rice cakes are often cooked with sliced fish cake and assorted vegetables. They’re coated with a delicious sweet and spicy sauce commonly found in many Korean dishes. 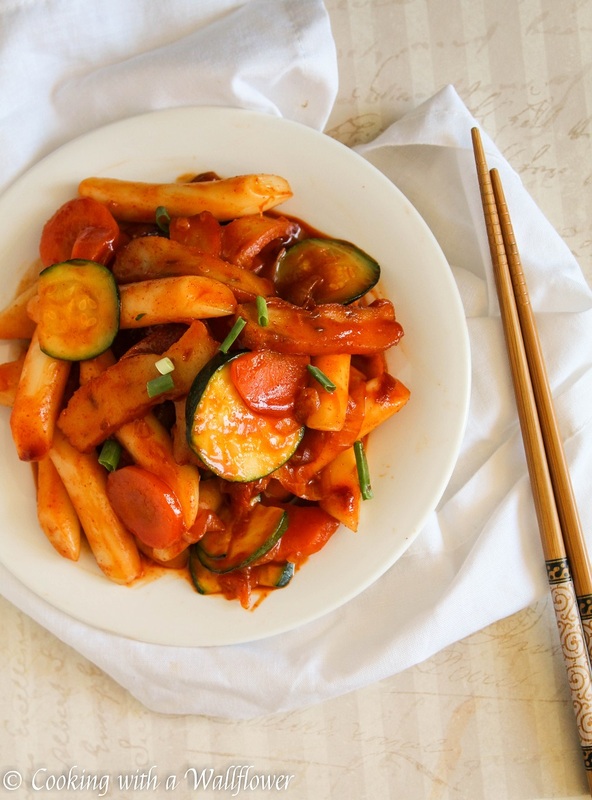 This Korean rice cake dish is so simple to make you’ll want to make them at home. 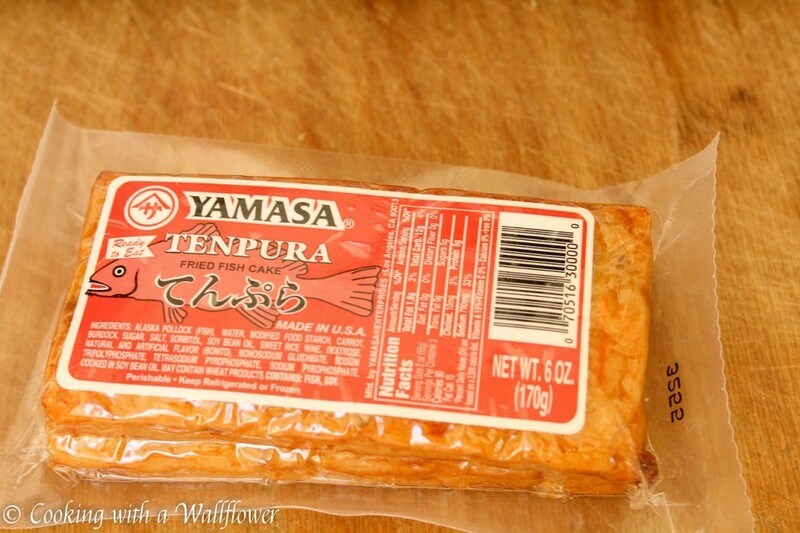 Soak about a pound of refrigerated rice cake in cold water for a few minutes. Drain the rice cakes and set them aside for now. Some people make the rice cakes from scratch, but I just bought them from an Asian supermarket. You can usually find them in the refrigerator section along with other noodles. 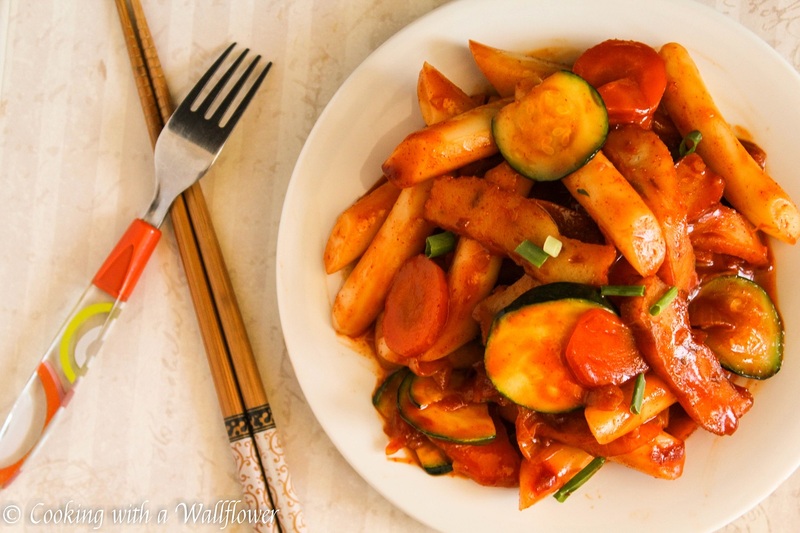 In a medium sized skillet, add gochujang chili paste, granulated sugar, soy sauce, honey, and ¼ cup water over low heat. Use a spatula to stir the ingredients until they form a sauce. Once the sauce forms a paste, add the rice cakes and cook them for a few minutes until they have softened. Next, add the sliced carrots, onions, zucchinis, minced garlic, and fish cake. Use the spatula to stir until they are evenly coated with the sauce. Allow them to simmer until all the ingredients are soft and tender. I also bought the fish cake, but you can make your own too. Serve the rice cakes warm. I’d love to see your photos! Tag any photos of my recipes that you made with #cookingwithawallflower. I’ll be sure to check them out. Soak the rice cakes in cold water for a few minutes, drain the rice cakes, and set them aside for now. In a medium sized skillet over low heat, mix together gochujang chili paste, granulated sugar, soy sauce, honey, and ¼ cup water. Stir the ingredients with a spatula until a sauce begins to form. Add the rice cakes to the sauce, and mix to coat the rice cakes with the sauce. Cook the rice cakes for a few minutes until they have softened. Next, add the minced garlic cloves, sliced onions, sliced zucchinis, sliced carrots, and sliced fish cake. Stir to evenly coat them with the sauce. The sauce will start to reduce. Slowly add the rest of the water to form a liquid sauce that will coat all the rice cakes, veggies, and fish cake. Once all the ingredients have softened, remove the skillet from heat. Plate the rice cakes, and serve warm. 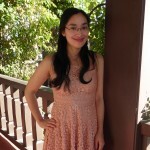 This entry was posted in Asian Inspired, Entree, Quick and Easy, Recipes and tagged Asian inspired, quick and easy, recipe. Korean Ddok (떡) is the bomb! 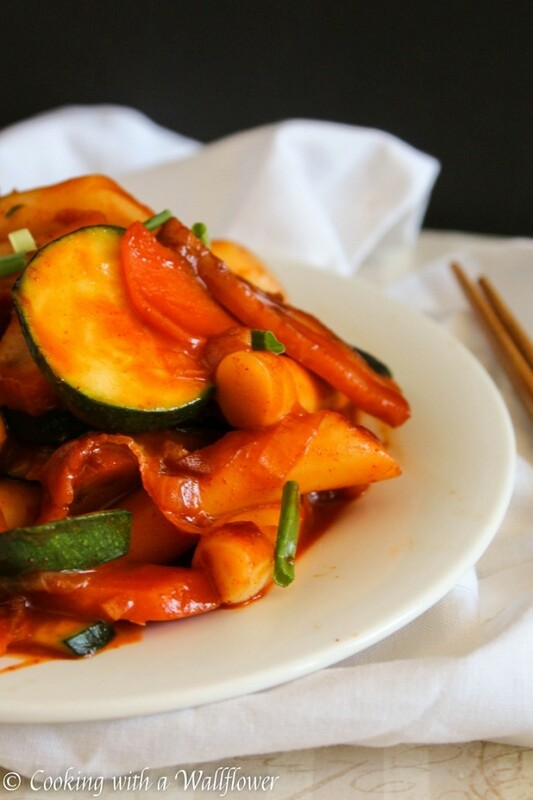 there is something about the korean red sweet and spicy sauce that gives a nice ‘kick’ to their dishes. i love it. do you like those little ‘starter dishes’ which they serve before the main meal? i just love them, at times more than the main dishes. Adding zucchini makes it look even more delicious 🙂 Good choice! Andrea! Just had those same rice cakes for the very first time at Takashi Yagihashi’s Slurping Turtle Restaurant in Ann Arbor MI last week–they are wonderful! Can’t wait to try this recipe. I love spice chewy Korean rice cakes. They tastes even better with the fish cakes. I love getting your updates. I am a “beginner” Korean foodie. By this I mean, I’m a bibimbop / bulgogi / radish kimchi kind of person. I also love the cold noodle soup!! I haven’t graduated to traditional kimchee or the spicy dishes yet. Although, I absolutely love the soup with the soft tofu that is red and comes sizzling in a bowl. Do you know the name of that soup? Anyhow, thanks for all of your lovely posts and beautiful photography. The soup is soft tofu soup. Depending on the restaurant, sometimes they give you a variety of soups, but they’re all soft tofu soup. I think it’s “Soon Tofu Jigae” in Korean.